Swansea City have won the Capital One Cup! (formerly the Carling Cup, formerly the Coca Cola Cup, formerly the… you get the idea) The Swans defeated league two minnows Bradford City 5-0. It’s the first time a Welsh Side has won an English Trophy since 1927 and naturally the Swansea fans partied long into the night. Leek and Pork Faggots were sold by the dozen, Tom Jones was played loudly and many farmers pretended certain sheep were Catherine Zeta-Jones. In Manchester, City defeated Chelsea 2-0 in an entertaining match. Carlos Tevez sealing the win with a great goal in the 85th minute, meaning if City win all their remaining matches and Man United lose all theirs they might just go back to back. But they won’t. United have this won. Back home and this weekend offers a probable A-League Grand Final preview with Central Coast Mariners hosting the Western Sydney Wanderers on Saturday evening. Will the Wanderers go top in their first season or will the Mariners continue their red hot form of going top then choking in the finals? Tune in on Saturday! Or don’t, you could just read this blog. I’ll report on it. I swear. 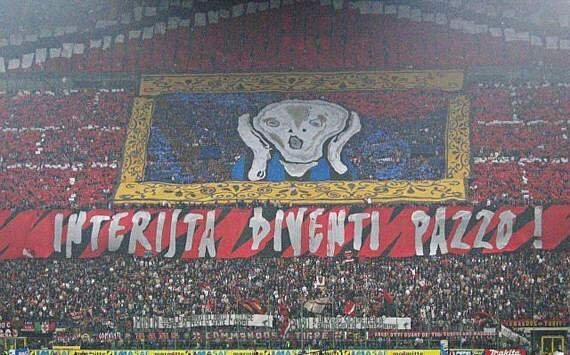 In Italy the Milan Derby ended in a 1-1 draw, but AC Milan had the better banners of the two sides. 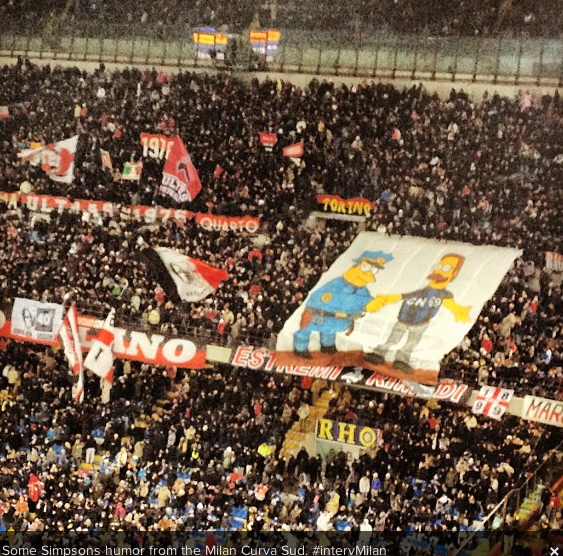 For some reason, Milan always show Inter fans as Ned Flanders. I don’t know why. Each week a guest columnist will tell you why their club is the greatest team in the world. Beginning with host of the B-League on Fox Sports, Sam Mac! Take it away Samuel…. 1) Will I be paid per word? or 2) Will it just be a flat fee for the piece? United would have no one to play (and dramatically improve our goal difference) against. retired about 15 years earlier. & a League Cup? Tough times, very tough times. – George Best, as mentioned earlier, he was my introduction to the club & a very special talent. – Sir Alex Ferguson, who built an empire & is genuinely a living legend. – Old Trafford, one of the few stadiums worldwide to perfectly marry the past & the present. – Eric Cantona, who remains my favourite footballer of all time (slightly ahead of Nikolai Topor Stanley). In closing, I’d just like to say that when the seagulls follow the trawler, it’s because they think sardines will be thrown into the sea. Thank you. Thank you Sam! Follow him on twitter – @mrsammac Go! If any readers of the Football Bluff would like to contribute or to suggest a famous football fan I should ask to help out drop me a line at dannymcginlay.com and hey, while you’re there why not buy tix to my comedy show?? Due to my best mate’s wedding last night and the arrival of a new baby into my family also last night there’s will be a very quick Football Bluff this week. Lots of people bet on Adelaide United v Melbourne Victory but match doesn’t appear to be fixed, Victory were just genuinely rubbish. I was on The B League last night – have a watch, it’s a brilliant show! The Melbourne Derby played out to an almost capacity crowd on Saturday night and the Victory once again took the honours. It was a battle of the goalkeepers and both Nathan Coe and Andrew Redmayne put on brilliant performances. The only negative of the match was the damage done to some seats at Docklands Stadium by the Heart “away” support. The AFL has demanded payment for the damage until they remembered that Docklands is home to the Western Bulldogs and no one was going to be using those seats anyway. David Beckham has signed for Paris Saint-Germaine! What’s more he’s donating all of the money to a children’s charity. What a guy! Our David, who can barely afford to feed his twelve butlers, donating all his cash to needy French kids! Bugger me, what a bloke! I’m sure it’s absolutely nothing to do with the French income tax rate of 75% on people earning over 1 million euros. Not at all. It’s just that he’s a top notch fella. There was a bit of embarrassment for Fulham on Saturday when their floodlights went out during their clash with Manchester United. Craven Cottage is a beautiful old stadium but it’s powered by badgers on treadmills under the pitch. The electrical fault was attributed to the badgers being frightened when they caught a glimpse of Wayne Rooney. The floodlights going out was pretty much the only moment of darkness for United this weekend as their two greatest rivals, Liverpool and City played out a 2-2 which could cost both dearly in the course of their seasons. Steven Gerrard scored a cracking long range shot in the 72nd minute but then Sergio Aguero equalised with an absolute squeaker over the head of the out of position Liverpool goalkeeper. This renders the Premier League all but gone to Man Utd. So now we can focus on the bigger stories – who can take out the mid table honours? Stoke or West Ham? Tune in next week!!! Clearly Cristiano Ronaldo can’t bear the thought of me not writing about him. Last week I claimed I would not report on the Spanish League as it was too repetitive. Well, Ronaldo has turned that around by scoring a winning own goal for Granada against Real Madrid. The match finished 1-0 and has shocked the Spanish football world. However I will not be bullied by players and I am now stating unequivocally that I will not be reporting on Ronaldo until he signs for Melbourne Victory.